I spent 25 minutes in a Spanish 9 class this week. I think it was one of the longest class visits I have had in the past three years. I realize my visits have become a quick walk-through — usually, no more than five minutes. When I am in schools, I do my best to visit seven or eight classrooms for a chance to see part of an activity, or to ask a few students to explain in their own words what they are learning. I do attend some of the teacher workshops and share in what they are doing, but I very rarely take the opportunity to observe the flow of a class. 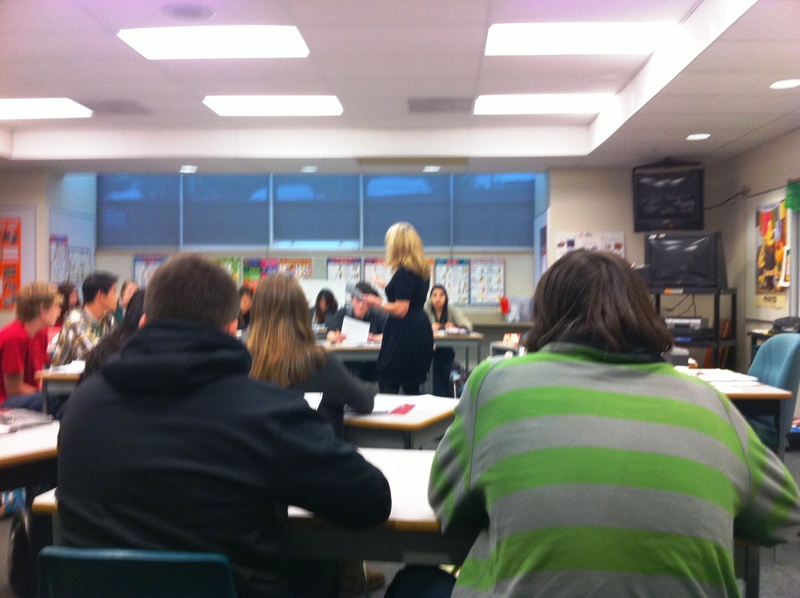 I had an amazing experience this week, in Ms. Michelle Metcalfe’s Spanish 9 class, at West Vancouver Secondary School. I had been encouraged to attend by Principal Steve Rauh; I have been meaning to visit for a while. I had the opportunity to see, first-hand, some very interesting work Ms. Metcalfe, as well as others in the Languages Department, have been doing using Teaching Proficiency through Reading and Storytelling (TPRS) as the core of their language instruction. TPRS, places the focus on fluency over grammatical accuracy; some of the results are very impressive. Students who have been taking Spanish for only five months were doing free-writes of up to 100 words. It was agreed, the success West Vancouver Secondary is having with TPRS is worth sharing and, this spring, we will find professional development opportunities for other teachers who want to learn more about it. I am also very curious about other experiences with this relatively new approach to language acquisition. TPRS, was only part of the story though. My time in Spanish 9 reminded me of what master teaching really means. Ms. Metcalfe had every student engaged. Spanish 9 draws an interesting mix of students. From my secondary principal days, I know the course does attract those interested in learning a second (or third, or fourth) language, but it has also attracted many learners who have struggled with French, and who need to find another language to help stay on the university path. Watching Ms. Metcalfe connect with the students, carefully timing her questions, checking for understanding and seamlessly moving between activities, is something that cannot be learned in a book. All students were truly engaged, leaning in towards her, and nobody was buying out. Ms. Metcalfe used every second of her class — right up to the bell. As she later explained, “We just can’t waste any time”. The experience epitomized the power of mixing the art and science of the profession. Thanks Ms. Metcalfe, Mr. Rauh, and the students of Spanish 9 — you engaged me in my best learning of the week. Thank you so much for this post! I have been teaching Spanish for nine years and have never taught any other way…TPRS truly works! I teach k-8 Spanish. My students can actually communicate in Spanish because of the TPRS method. I can’t wait to tweet your post! Chris, it’s great that as a superintendant you can spend 25 minutes in a class just getting involved. I read some blogs about a month ago about a princiapl spending entire days in classes being engaged witht he teacher and learners (sorry can’t find it right now). I’m inspired. I am a new Elementary Principal, and I’m sure can find that time to spend in a class. As I look at my google calendar (in my opinion the best) for tomorrow I see an opening between recess and lunch. I’m going to find a class, sit down, and enjoy. I challenge all other school administrators to do the same this week. Then tweet it with #25minutes as a hashtag. You know it will be the best 25 minutes you spend all week. So, Kyle, how did it go? In my first three years of teaching, I made it a point to observe every single teacher in my building, and happily everyone of them was happy to have me come watch for a bit. It really helps you understand how someone is using a particular pedagogical technique when you see it in action. There’s something different about reading about a style of pedagogy, and seeing it in use. Personally I wish more teachers had the opportunity to observe other educators at work. What a great approach David – getting to see every teacher must have been amazingly powerful. Interesting about teachers observing teacehers, is it that they don’t have the opportunity or is it that they don’t take the opportunity? I often hear stories of models put in place to allow teachers to observe others in the school and nobody signs up. I had the good fortune of teaching english in Korea for many years. The focus from the programs was always on grammar. I felt this hampered my students in many ways. They were too focused on the grammar and it often caused them to freeze up whenever the attempted to speak English. I look forward to utilizing this new approach with future ESL students. Watching great teachers perform their art with their students is inspiring. I wish we had more opportunities to observe fellow teachers. I don’t have a lot of experience with second language learning – but I reflect on my own experiences learning French. I learned the words and all the grammar but I never really “got it”. What I loved in this class was that clearly the students did get it. I really like the emphasis on fluency over grammatical rules. So often the “rules” act as a barrier for students trying to stretch themsleves in the real-life application of a new language. From a leadership perspective, the walk-throughs can be great conversation starters, however, they are dependent on walking through at the right time. I think your message emphasizes quality over quantity; that one quality observation is more valuable than 3 quick ones. Now, how do we get our staffs to have quality observations of one another? The most powerful pro-d…when it happens. Thanks for the post. I really enjoy your blog. Thanks Tom. I also love that you have taken to blogging – it is great to connect. I have become so accustomed to the rhythm of the walk-through – I forgot the joy of seeing the full class in action. Beyond evaluations, I have rarely taken time for it over teh last decade. Getting teachers into each others classrooms is a challenge. It is frustrating for me, that ever since my job has evolved to enrolling fewer classes I have had more experiences to see great teachers and great teaching in action – if I knew then what I know now . . . .
Really like this post, so much so that I am sharing it with members of my Languages Department! That is really great Chris, spending time in a classroom while in your role. I didn’t meet a district assistant superintendent until eleven years into my teaching career. Cathy Thornicroft changed that when she was in Richmond and visited the school I was working at, observing and interacting, like you were. This really is awesome for teachers. Hi Bernie – Welcome to Semester 2! I hope you encourage your new Assistant Superintendent Scott Robinson to visiit. We worked together in Coquitlam and he is very focussed on the classroom. It is so important to connect with teh latest in instruction and learning – I love when I leave a class with new ideas. Thanks for the ongoing encouragement. this is where all my materials for my K-8 students have come from for the last nine years. They have really evolved and are also coming into this 21st century digital age. The books can be used for all ages. I can help too. I’ve been using the method ever since I did my student teaching. This is a wonderful post! It’s great to hear that a superintendent is visiting classrooms and finding out what works. As another TPRS teacher, I can say that this method has given new life to me and many others. Those interested in more training should know that there’s a national conference in St. Louis this summer (NTPRS); probably more than 300 teachers will attend; and a small conference with Carol Gaab’s team at Club Med in Cancun (sounds suspicious I know, but I attended the one in Ixtapa last summer and had perhaps the best teacher training ever in 26 years of attending courses). Something that also might also be of interest is that a few people have started to adapt the TPRS method to other disciplines. I use it in both my Russian and English classes, but others use it for science, math and history at the elementary levels. The idea of presenting students with completely comprehensible information is not typical in our schools. Learning easily has a bad rep, but once kids and teachers get used to it, they fly! I also had an opportunity to experience how TPRS works in a language classroom. With a mini lesson. Ms. Michelle Metcalfe and Ms. Bess Underhill, two fantastic Spanish teachers, shared their teaching throught story telling with us language teachers at WVSS on our last Professional Development Day. Although the instruction and interaction were all in Spanish, we learned the language effectively and engagingly. I wish the TPRS approach could also be employed in teaching non-alphabetic languages. Chris, thanks for your inspiring blog. If you’re mean languages like Japanese and Chinese as examples of non-alphabetic languages, here’s some good news! Linda Li has been teaching Chinese all over the country with the Fast Fluency group as well as in the NTPRS conferences. Terry Thatcher Waltz in Albany is mentoring teachers in Chinese with TPRS. And teachers at Dimond High in Anchorage, Alaska, use TPRS in their Japanese classes. There are even teachers of Arabic using TPRS. Could you tell me where Iget this specific information about how to use this approach to teach Mandarin? There are a number of sources, most addressing the teaching of all languages. I would start with joining the board at moretprs.com –it’s free, and members there will answer any question you have. The TPRS community is a remarkably open, sharing one. Terry Thatcher Waltz will probably be at the National TPRS conference this year in St. Louis–but you can also find her through her web page. She has generously mentored teachers of all languages including Chinese. Here’s the link for that conference, which will blow your mind because you’ll leave with solid support, knowledge and excitement: http://www.ntprs.org/ntprs.org/HOME.html — there are also great links for more information on the page. As a Russian teacher, I used to attend conferences and workshops with teachers of Spanish and French and despair because they seemed to have so much material available, and the activities required me to adapt so much. I have just come home from our monthly TPRS teacher practice session where most of the teachers were Japanese, and was able to learn from and share with them completely as an equal. Learning how to use TPRS does not require that someone show you with Mandarin; instead, it’s best if you learn from someone who is teaching a language you do not know. At NTPRS this summer (or at any of the other TPRS workshops all around the country and world), you will have a chance to experience learning other languages and try your hand at using the basics. For Mandarin resources: Check fluencyfast.com. I took an amazing Mandarin Course with Linda Li this summer. She uses this approach. I teach FLEX (in MN) using TPRS at the 4th and 5th grade levels. I would like more info on how elementary teachers are using TPRS strategies in math, science and history! Can someone help in get in touch with teachers doing just that? You don’t know me but I was in your class at NTPRS almost two years ago!! I’ve seen messages about this on the yahoo tprs group. I can never remember how to get there, so maybe it would be best to post a query on the moretprs.com board. Thanks, MJ and Elissa, for sharing the valuable sources for language teaching! Hanci – so pleased that the blog was a place that was helpful for gaining / sharing resources. I’m a university student in English department and I’m working on my thesis about TPRS but I was at a stalemate because I found it’s hard to get the book in my country. can you help me to find e-book or where can I buy the book? my lecturer won’t be happy if my sources are only from the internet.